The state of Jammu and Kashmir (J&K) is the northern-most state of India, comprising Jammu, Kashmir, and Ladakh. Situated amongst the Himalayas, lush with verdant hills, green valleys, pouring waterfalls, and pretty colourful meadows, Kashmir is justly called a “Paradise” on earth. Take the Kashmir Holiday Package to discover a region of unending beauty, besides a rich variety of flora and fauna and its famous Chinar (maple) trees. Spring is the time when Kashmir bursts into a riot of colors and millions of flowers carpet the landscape. Travellers would be bewildered on their visit to The Mughal Gardens in Srinagar, described with terraced lawns, cascading fountains, paint-box-bright flowerbeds with the panorama of the Dal Lake in front of them, named as the Chasmashahi, Nishat and Shalimar as they are the Mughal Emperor’s concept of paradise and are today very popular places for picnics and excursions. The historical structure of these gardens lends them a unique sense of serenity even when the flowers are not blossoming. Nishat Bagh with the Zabarwan Mountains as its backdrop is a `garden of bliss’ which commands a magnificient view of the lake and the snow-capped Pir Panjal mountain range towards the west of the valley. Shalimar Bagh in front of the Dal Lake was built by Emperor Jahangir and Chashmashahi is another spectacle. Hazratbal Mosque, the white mosque, is breathtakingly enchanting, and it would be a pleasure taking a walk through the adjacent market area displaying a range of great fresh food. The Shankaracharya Mandir, on a hill top, is a Hindu temple dedicated to Lord Shiva, and is visible from the Dal Lake. The Pari Mahal lends a breathtaking view of the city and the Nehru Garden, off Dal Gate, occupies a large area and is known for serving hot and flavoured `Kahwa’, a traditional drink of Kashmir, a different flavour worth tasting! Go for a Shikara ride in the Dal Lake for better views and a more peaceful cruise in an area devoid of other tourists, admiring the fountain amidst majestic mountains and tranquility . A must see is the `village’ in the lake where the tourists can move towards the side where locals live to view the floating vegetable market. Availing a stay in a House Boat in the Lake would be another nouvea experience! 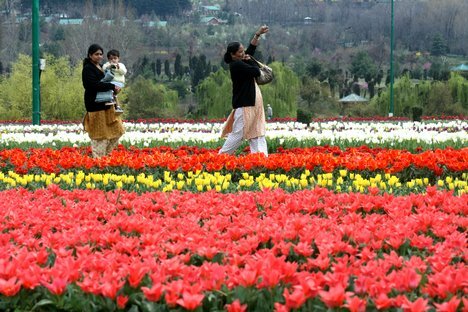 The "Tulip Garden"-arguably the largest of its' kind in Asia is located just opposite the main Boulevard Road on the shores of the Dal Lake. Try fishing in any of the lakes in Srinagar as the resort of `Aharbal’ offers excellent fishing opportunities with a great waterfall. "Daksum" is very famous for its scenic mountain beauty and clear, sparkling streams, with bountiful of catch. The Kashmir valley is also known for for its sericulture and cold-water fisheries. Tourists may visit the ruins of Parihaspora, Dewar, located on the outskirts of Srinagar on way to Gulmarg, and also view the palaces of Kashmir's Buddhist and Hindu rulers and Buddhist places of worship. "Badamvaer"- Kashmiri, called “The garden of almond blossoms" lies on the foot end of the Hari Parbat Fort, and has now been restored, and is a sight that is unmistakably magical! Angling in the many fresh water streams is an attraction in spring as well, or if travellers missed out on skiing in winter, they could go to Gulmarg, the `meadow of flowers’ ,which is a perennial favourite and has the highest ski slopes in Asia offering excellent opportunities. `Pahalgam’ or the` Village of Shepherds’ has some magnificent plains where horse-riding is in demand and there are some fantastic angler opportunities and plenty of trekking routes for an exciting climb. Sonamarg meaning `Meadow of Gold’ lies in the valley carved by the river, surrounded by towering snow-capped mountains. Capture this mystical land creeping into the lap of bewilderment, on the Kashmir Holiday Package! Kashmir handicrafts, shawls and carpets are world famous and Pashmina is an exclusively Kashmiri art skill hand embroidered by their artisans. The intricacies of hand-made Kashmiri carpets is well-acknowledged globally and plenty of hard work goes into the crafting of these pieces and this skill was introduced to the workers through the silk trade route by a famous sufi saint of Persia.An original Kashmir carpet can be very expensive but the right one can be as prized or treasured as any work of art! Tourists may buy nice leather products, or jewellery, embroidered felt mats called chainstitch rugs or Namdahs in bright woollen colours, found in the Government Emporia and some of the private shops, determined in two styles, English design or Kilim design. Papier Mache products are quite unique to Kashmir with colourful motifs and designs on them and resemble pottery in shape and style. Wood from Kashmir is used to make high-quality cricket bats, popularly known as Kashmir Willow, and the famed Kashmiri saffron, bought by most tourists, brings the state a handsome amount of revenue. Agricultural exports from the state include apples, barley, cherries, corn, millet, oranges, rice, peaches, pears, saffron, sorghum, vegetables, and wheat, while manufactured exports include handicrafts, rugs, firans and shawls, all of these available for purchase throughout Kashmir. Interesting shopping on the Kashmir Holiday Package! There are a number of restaurants and cafes in Srinagar and most of the good ones are located in Lal Chowk or on Boulevard Road, along the banks of the Dal Lake serving Kashmiri, Indian, Mughlai and 'Indianized' Chinese dishes. Some pure vegetarian restaurants are also located along the Boulevard Road such as the ‘Krishna Dhaba', most popular for its Rajma-and-Kheer. Make sure you to try dishes like Rogan-Gosht (meat cooked in red gravy), Gushtaba(soft meat balls cooked in natural yoghurt),Rishta (Soft Meat Balls in delicious Gravy), Tabakmaaz(deep fried ribs of a lamb) and Kanti(small chunks of meat cooked with a lot of onions). All these meat items are usually eaten with rice; hence the gravy is not thick. Another popular local delicacy called Seekh-Tuji, consists of marinated meat pieces which are freshly barbecued and eaten with chutney. Most of the vendors are located in the Khayaam region of the city and this place is usually teeming with the youth especially in the evenings. Enjoy the grilled mutton available in Srinagar, which is referred to as a "tilli" or "tekh" and mostly eaten by locals. Most of this food would be available at other locations in Kashmir. Since most of the year is quite cold, tourists may take the Kashmir Holiday Package in the summers for mesmerising outdoors, as Srinagar is called the summer capital, whereas Jammu is called the winere capital of the state of Jammu and Kashmir. The winters are almost drowned in heavy snow in the picturesque mountains and thick woollens are required for places like Gulmarg, Pahalgam and Sonamarg, and light woollens may be carried in the summer months. Jammu has numerous shrines to enchant tourists, attracting thousands of Buddhist pilgrims every year and legacy monuments including Amar Mahal Palace Museum, the popular Raghunath and Ranbireshwar temples, Dargah of Peer Budhan Ali Shah, Peer Kho Cave temple, Bahu Fort and Bagh-e-Bahu, and is warm in summers and cold in winters. Ladakh, also known as "Little Tibet” and another region in the State, is renowned for its remote snow-clad beauty and Buddhist culture. 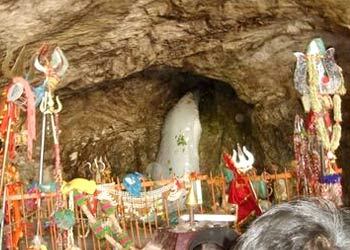 The tourists have the option of availing a trip to the above places, at the beginning or end of their journey. Return with memories of bewitching moments on the Kashmir Holiday Package!